Our Space Coast Basket Brigade began in 2009 when sisters Keri and Erin Allen surprise delivered 4 baskets to families in need in our community. The following year, older sister Jacqueline Giurleo and Mom, April Aulisio, became involved and together the family set the goal of 15 baskets. Friends heard of the families efforts and word spread with others wanting become involved. 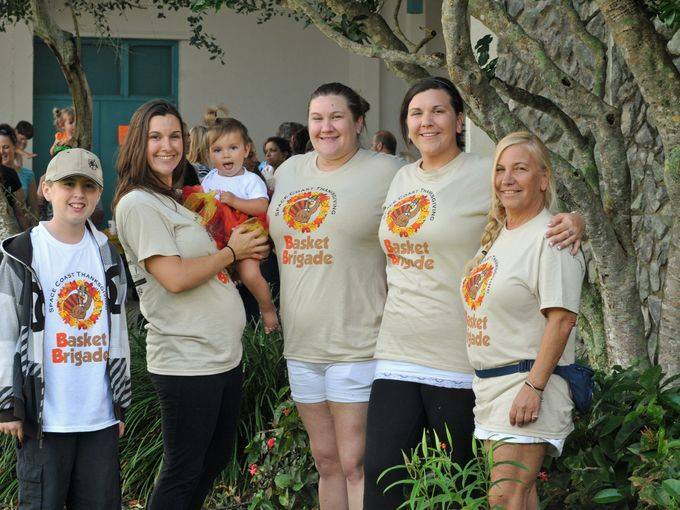 That year they surpassed their goal of 15 by delivering 96 baskets and the Space Coast Basket Brigade was officially created. Since then, the event has grown to become a community favorite. Now more than 1000+ volunteers join each year, and to date more than 6000 Thanksgiving baskets have been delivered. The Basket Brigade is unique in the sense that it provides an opportunities for all ages to participate and for families to volunteer together. It is an great way for children to experience both gratitude and giving back, and also truly see the difference on what their contributions mean to another family by personally delivering the baskets. We invite you to join us for our next Brigade. Click the links to the right to volunteer or get directions to the Brigade! We have more than 2500 homeless children in Brevard county, our Brigade will provide baskets to families who are experiencing challenges of all kinds, and also deliver more than 150 In Transition baskets to families living in shelters, hotels, motels, tents, and even outside. It’s magical when you come together when more than 600 other volunteers, all from our small Space Coast community, and see what is possible when so many great people commit together for a great cause. It’s more than a meal, you are giving a Mom, Dad, Grandparent, or Guardian the ability to know that their children will get to experience a Thanksgiving meal this holiday, and a family the opportunity to sit down together and share in that experience.